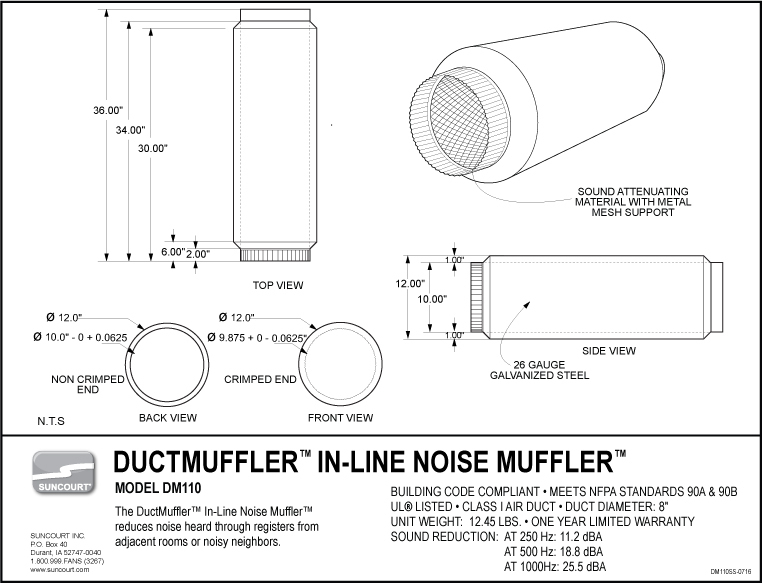 The DuctMuffler™ may be installed in new or existing ductwork between the source of noise and the register emitting noise. The best location is as close as possible to the source of noise, but not closer than 3 feet. The unit may be positioned so that either end faces toward the furnace. It is recommended that the unit be installed using sheet metal screws and standard metal duct support brackets (not supplied). The DuctMuffler™ may cause damage or injury should it fall. Finish the installation by sealing the joints with good quality aluminum foil duct tape. Subject to the following limitations, Suncourt® Inc. (manufacturer) warrants that the DuctMuffler™ will, for 1 (one) year from date of original retail purchase, but not exceeding 2 (two) years from date of manufacture, remain free from appearance of defects in workmanship or materials. This warranty is subject to the following limitations: (a) manufacturer’s liability is limited to the replacement or repair of the unit, as decided by the manufacturer; (b) a defective unit must be returned, prepaid, with proof of purchase, well packaged to avoid damage in transit; and (c) this warranty does not apply to defects resulting from the alteration, abuse, accidental damage, unauthorized repair, or misuse of the unit. This warranty is given in lieu of all other warranties, guarantees, and conditions on manufacturer’s part, and the manufacturer shall have no tortious or other liability in respect to this DuctMuffler™. Ship unit to Suncourt® Inc. only after obtaining a Return Goods Authorization (RGA) number. Returns without this RGA number will not be accepted.Actual product appearance may differ from illustrations. Suncourt reserves the right to modify any or all of its products' features, designs, components and specifications without notice. The Suncourt® DuctMuffler™ also sometimes known as a Duct Silencer is a passive device that is installed in ductwork to help attenuate (that means reduce) the level of noise that is transmitted through the duct. What would I use a DuctMuffler™ for? Home Theater Noise Reduction-Quiet the sound of the furnace or other noises in the home to make the acoustics you spent so much money on sound just right. A DuctMuffler™ will also keep noise from a Home Theater Room from spreading to the rest of the house. Conference Room Noise Reduction-Help from spreading to every office cubicle near a register the things you would prefer to keep quiet in your conference room. Lecture Hall Noise Reduction-Attendees can concentrate on the speaker instead of the noises the ventilation system is making. Music Studio Noise Reduction-Duct Silencers are a tremendous help when recording, especially if multiple studios have different things going on all at the same time. Household Noise Reduction-You can sleep better when you don’t have to listen to fans, furnaces, air conditioners, or noise from other parts of the house. How does a Suncourt® DuctMuffler™ work? The Suncourt® DuctMuffler™ is a completely passive device that will not impede airflow when it is attached to the ductwork. It is made of metal and is lined with an acoustic insulation that reduces sound. The insulation is covered with a wire mesh to keep the insulation in place. Why do I need a DuctMuffler™? The DuctMuffler™ will reduce sound traveling through ducts, i.e. loud music from adjacent rooms, snoring, speech and noise generated by the furnace blower. How do I install a DuctMuffler™? Simply remove a section of air duct from the offending duct run and insert a DuctMuffler™. The DuctMuffler™ is a heavy product and must be properly supported using duct support brackets available at your favorite Home Center. How effective is a DuctMuffler™? Please note that every 3 dBA in noise level reduction may cut your perception of noise by half. Visit the noise page in this FAQ section. Does the DuctMuffler™ affect airflow through my ducts? No. The open bore of the muffler is the same as the duct in which it is installed. There are no baffles or barriers. No. No maintenance is required. No, the DuctMuffler™ is a passive device.